THEY DID IT! 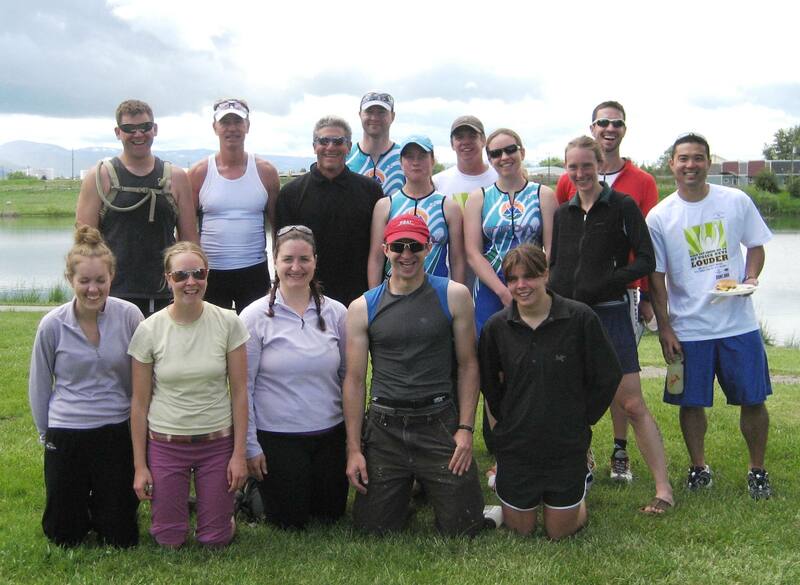 MAJOR LEAGUE SMILES & SUPER HAPPY TRITONS AFTER THE TREASURE STATE TRIATHLON ON SUNDAY. WOW! You Can Feel the Smiles. Thanks to Jonathan Rice for the Terrific Photo! Front Row: Katie Boyce, Jamie Kujawa, Jen Masquelier, Jonathan Rice, Hannah Chura. Back Row: Micca Henry, Bill Claridge, Martin Coleman, Jeremy leFeber, Bridget Benjamin, Chris Martin, Lander Purvis, Kezia Manlove, Jonathan Long, Ryan Takeshita. Tritons Rack Up 500 Points For USAT Pacific Northwest Club Championships! Seventeen Tritons participated in the 2009 Treasures State Triathlon. Winning their division, Jonathan Long, Mandy Axelson, Sherri Pearson and Molly Hayes took home the gold! Jonathan Rice and Bill Claridge landed silvers, while Jeremy leFeber and Bridget Benjamin finished with a bronze. Overall, and unofficially, Tritons accumulated 491.79 points towards the 2009 USAT Pacific Northwest Club Championships. Congrats to all, for a terrific race. Spring Meadow awaits! For more about the Championships, click here — http://usatriathlon.org/content/index/6043. THEY DID IT! MORE MAJOR LEAGUE SMILES AND SUPER HAPPY TRITONS. AMAZING! 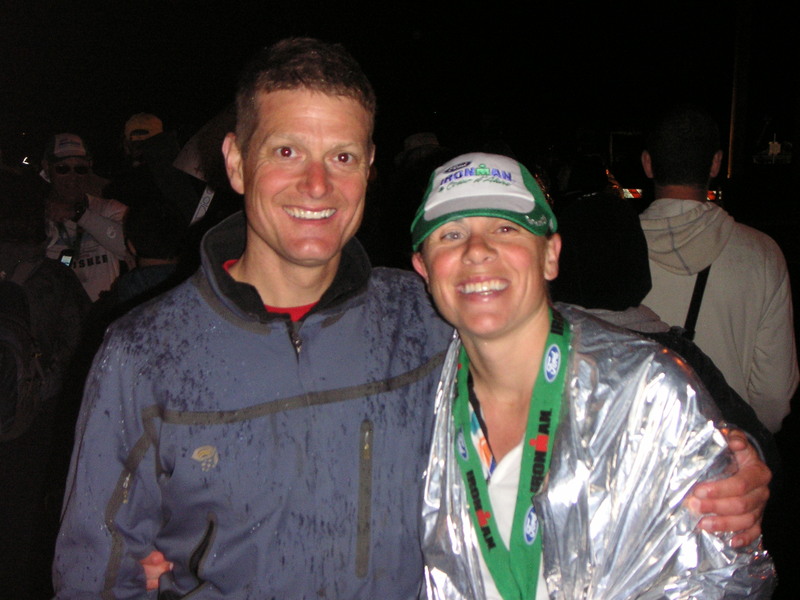 Lawrence & Carrie at Finish of Ironman CDA, 15 Hours After Start of the Race. You Can Feel Their Smiles, too! Is Registration for 2010 Still Open? Congratulations to Carrie, Lawrence, Rachael & Matt for the Awesome Finishes! The Hurt On the Dirt Duathlon is back for 2009 and is being hosted by Triton Sponsor Homestake Lodge on Homestake Pass near Butte. Racers may either compete as individuals or in teams. There are classes for adults and two junior categories. After the event there will be a barbecue, beverages, and music. Adult distances are 8 miles/bike, and 4 miles/run. The Under 10 Junior Course is 2 miles/bike, and 1 mile/run, the under 14 Junior Course is 4 miles/bike and 2 miles/run. Terrain is a combination of logging roads, trails, and single track suitable for most riders and runners. Adult Individual – $30.00, Adult Relay – $35.00, Youth – $12.50, additional barbecue ticket $7.50 (1 bbq ticket included with race entry). Entry form is available at www.homestakelodge.com or online at www.active.com/page/Event_Details.htm?event_id=1692383&assetId=c8f2d273-410a-40b5-83c7-34c9860bafa3.